A question I received: I had an interesting thought: maybe the reason for the current crisis isn’t that egoism is growing, but the opposite: that egoism has stopped growing, has ceased developing? When humanity’s egoism was growing, humanity constantly adopted new levels of social development. But now it resembles a horse that can’t pull anymore – it has stopped and is beginning to eat all the grass around it. And when that grass runs out, the horse will die. Or the horse will have to find the strength to go on. If this is so, then it would be more correct not to cure people of the egoism that they already have, but on the contrary, to stimulate their egoism to grow to a new level, to reach a new level of desires. And we can do this by telling them about all the wonderful things that await them at the next stage. My Answer: This is exactly what Kabbalah does: It doesn’t scare people with what’s happening in the present, but shows them the reason for the crisis in order to tear them away from making pointless efforts to “bring the dead back to life” using the old methods. In order to tear people away from egoism, it tells them about the evil in it; but then, in order to draw them forward, for them to desire something higher and better, it draws them to the study, which speaks only about the higher and better world. A person’s soul consists of two parts, called Galgalta Eynaim and AHP. The holiday of Hanukkah symbolizes the correction of the Galgalta Eynaim, and the holiday of Purim symbolizes the correction of the AHP. This is why there are customs in our world to celebrate these events in a person’s spiritual path. What is the spiritual root of Hanukkah? A question I received: I wanted to talk to you or your assistants about certain special abilities people have, such as the ability to penetrate into the world’s secrets with the help of a Guardian Angel. I would very much appreciate it if you counsel me as to what to do next! For a long time now I haven’t had the courage to take this matter further. My Answer: I receive many questions similar to yours, but I always delete them without answering. I’ve decided to answer your question as an example to all the others. I don’t discuss anything unrelated to Kabbalah, and I don’t argue about who’s right and who’s wrong. I also don’t try to persuade anyone that I’m the only one with the truth. It is your right – and an obligation given to you by the Creator – to search for and select your own path, truth, faith and goal in life. I only answer questions about Kabbalah, because seeing as Kabbalah is by definition the method of revealing the Creator to man, it includes everything else, provided that those things exist! I participated in a discussion called “Power and Capital” for the TV program, “The Butterfly Effect.” I spoke with Amir Hen, a famous Israeli attorney in the field of economics, finance and business (right). Summary: How should we create business contracts between people and corporations if we are to take into account the global interconnection of all people and the society, the absolute interdependence between everyone in the world? This is something that no computation system can estimate! However, if the person doing business will simply aspire to give everyone the opportunity to make a living, and to keep for himself only as much as he needs to exist, in order to become similar to Nature or to a living organism, then he will find himself in harmony with the world and fulfilled by the Upper World! 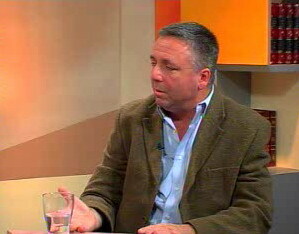 News Report (translated from zman.com): The famous comedian and TV host, Gil Kopach, will head the “Ale Yarok” party, which campaigns for the decriminalization of pot (marijuana) in Israel. Kopach will replace Chairman Shlomi Sandak, who was unable to get elected to the Knesset in past elections. The reason for the party’s failure may be the “anonymity” of its former leader. According to official statistics, about 1,200,000 Israelis use light drugs, but the party that proposes to free them from the threat of jail has never been able to get past the electoral barrier. This time they are counting on Kopach’s popularity. The actor refused to comment on the new offer, which will mark a radical change in his career. 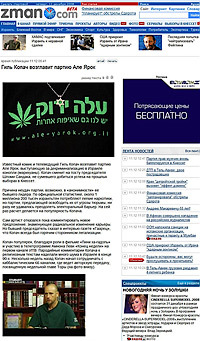 However, the former Chairman stated in an interview with the Haaretz newspaper that Kopach has always been a passionate supporter of legalizing marijuana. Kopach owes his popularity to his role in the movie, “Pini Ha-Gadol” and in Amnon Levi’s TV program “The End of the Week” on Channel 1 of ITV. Kopach’s parodies and ironic commentaries on religious texts caused a big stir in Israel at the end of the 90s. 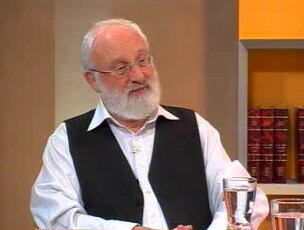 A few weeks ago Kopach began to collaborate with The Kabbalah Channel – YES 66, where he hosts a talk show about the weekly Torah portion (shown on the photo below). My Comment: I was introduced to a young, pleasant looking man who looked about 30 years old, and I was told that he is a popular TV commentator on the Torah who is interested in discussing the Torah with me on our Kabbalah TV channel. This happened a few weeks ago, and that’s how we began our weekly talks. We discuss the weekly Torah portions; Gil talks about them from the literary perspective, while I talk about their Kabbalistic meaning. By the way, I did not notice any irony when he talked about the Biblical texts. On the contrary, I saw an attitude of care and respect. Actually, I get the feeling that he is “coming back to faith,” but of course I don’t ask him about it since it’s his personal business. I hear that the show is popular. And of course, I don’t care about my conversation partner’s political or social engagements. Our contact is limited to the discussion of the Torah – no drugs included! News Report (from Federal Highway Administration): “Nearly 10 Billion Fewer Miles Driven in May 2008 than May 2007” U.S. Secretary of Transportation Mary E. Peters said that Americans drove 9.6 billion fewer vehicle-miles traveled (VMT) in May 2008 than in May 2007, according to the Federal Highway Administration data. … This continues a seven-month trend that amounts to 40.5 billion fewer miles traveled between November 2007 and May 2008 than the same period a year before, she said. My Comment: This will not only put an end to a completely excessive production, but will also help clean up the atmosphere. This is one example of nature using alternative methods to force man to become an ecologically integral part of it. News Report (from The Wall Street Journal): “An Ode to Oil” by Roger Howard: While there are, of course, circumstances in which oil can exacerbate tensions and be a source of conflict, it can also act as a peacemaker and source of stability. … Leonid Fedun, a top official at Lukoil, Russia’s No. 2 oil producer, admitted … that “the period of intense oil production [growth] is over.” Without foreign money and expertise to extract offshore oil and prolong the lifespan of existing wells, Russian production will fall dramatically. My Comment: And that’s how we get operation “forcing peace” – through oil! The Russian economy is based on oil production, and from now on it will be dependent on foreign investments and technologies. This will force Russia to make peace with other nations. News Report (from The Economist): According to Google’s annual list of popular search terms, even in these times of economic crisis, people are most concerned with working out what love is. My Comment: This shows the truth of the verse, “Love and hunger rule the world.” The forces of nature (Reshimot and the Light) acting within us will force us, in accordance with nature’s plan, to ascend from the animate love and hunger to the spiritual ones: hunger for unification, and fulfillment by the common Light of love. Question: Baal HaSulam writes in the book Shamati, in article #27, “What Is, The Lord Is High And The Low Will See,” that if a person annuls his “I,” he sees the Creator! What is this feeling of shame and humiliation that is being spoken of here? Why does the world humiliate and degrade him? My Answer: A person who corrects himself constantly receives new, additional portions of egoism so that by correcting them he can rise even higher. This is how he rises through all 125 degrees until reaching the full correction. In order to help a person overcome the new egoism that is constantly being revealed in him, the Creator sends him the disdain of the society. Otherwise a person would hear praise from the society and “sell himself” for it. He would begin to enjoy the honor and glory of being a “righteous man,” since he still doesn’t have the protection of the next portion of egoism that will be revealed. Question: It is written that the Creator loved Moses for his humility. I see that different trials in life make us more humble. You recommend for us to see our friends as being greater than us. What does it mean to be humble? When we nullify ourselves, how do we avoid making the same mistake as the followers of the Eastern teachings make? 1. Realizing that you cannot go through correction on your own, but you aspire to this and desire the Upper Light to correct you. A person cannot correct anything about him on his own! Otherwise, instead of being humble, he will feel proud of his humility! 2. Humility emerges as a result of revealing the Creator’s greatness. One who does not reveal the Creator by studying Kabbalah, does not attain humility and is sure to be full of empty pride. Laitman.com Post: Is Pride a Form of Egoism?